Super Bowl XXXVIII was played on February 1, 2004 by the New England Patriots and Carolina Panthers. The final score of this game was 32-29 and it was played at Reliant Stadium in Houston, Texas. The head referee of the game was Ed Hochuli. The National Anthem was sung by Beyonce Knowles and the game aired on the CBS network. Tom Brady was yet again the MVP! At the time of this MVP status he was quarterback for the Patriots. This was the second time in three years that he was named MVP, which isn’t a bad record to hold. This time he set a Super Bowl record for the most pass completions. Tom Brady also completed 66.7% of his passes. Many of you may remember this Super Bowl thanks to Janet Jackson’s halftime performance. At this game she let the cat out of the bag. There were a total of 89.8 million viewers during the game with a Nielsen Rating of 41.3. The cost of a 30 second commercial in 2004 at Super Bowl XXXVIII was $2.2 million. The announcers for the game were Greg Gumbel, Phil Simms, Armen Keteyian, and Bonnie Berstein. 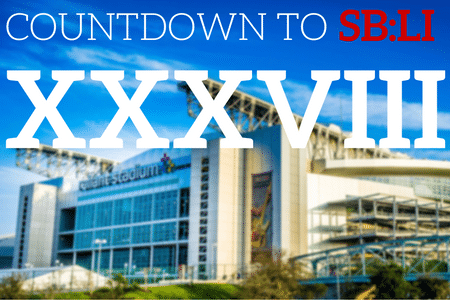 Check the Super Bowl off your bucket list by booking your travel package to Super Bowl LI today! Luxurious hotels, the 2017 Players Tailgate and more! **The phrase Super Bowl is a registered trademark owned and licensed by the National Football League. SuperBowlTickets.net is not affiliated with, supported or endorsed by the NFL in any way. Our use of the term is for informational purposes only.